Ok so I'm a bit thick but I dont understand this. This is a summery taken from a book on frame design: Fork rake is the perpendicular distance between the head tube centre line and the front wheel axis. ie, the amount by which your forks are bent forward. For any given wheel radius and head tube angle (that's the angle between the centre line of the head tube and the horizontal) there is only one fork rake that will achieve neutral steering. Ok that makes sense to me but here's the bit I dont understand - Neutral steering simply means that the forks will neither rise nor fall when turned. astonishing??? I dont get it. Imagine the forks as normal, but with a long right-angle at the bottom. The wheel being fastened right at the end of the right-angle. If you steered the bike like that, the front of the bike would lift. Remember that the head tube and steering axis are never vertical. Take a bike and measure the height of the front of the frame (e.g. front end of the top tube) as you steer from side to side. They're saying, I think, that the front of the frame will rise or fall a small amount as you turn the steering. Whether it rises or falls depends on the geometry. If the frame lowers as you turn, your weight, pushing the frame down, is also trying to push the steering to turn sharper. If the frame rises when you turn, your weight is resisting the turn and trying to steer straight. The red line shows the extent to which the wheel centre is offset from the axis of the steering head bearings. A is the point of contact between wheel and road. B is the point where the steering axis meets the road surface. If you imagine looking down through the steering head, when the bars are turned you would see the point of contact A moving around B on a circular path. As the point of contact moves away from the straight running position the tyre will also be moving upwards, away from the road surface, so the front end of the bike will drop slightly to remain in contact. The weight will be supported, but not quite as before - the contact point will now be off to one side of the steering axis, so the weight will now, in the example sketched, be helping to turn the steering further - positive feedback. If you look at the diagram I hope you can see how by rearranging things to alter the length of the red line it would, at least in theory, be possible to superimpose B and A. In this special case, the front end would neither drop nor rise, and the weight would always act along the axis so having no turning effect. This is neutral steering. I hope this helps - I quite enjoyed trying to explain it. Ms Paint, eh! Remember that? Fonant wrote: Take a bike and measure the height of the front of the frame (e.g. front end of the top tube) as you steer from side to side. They're saying, I think, that the front of the frame will rise or fall a small amount as you turn the steering. Whether it rises or falls depends on the geometry. Thanks Fonant. Nearly. If you consider the rake on the forks to be as Mick F suggests a right angle then because of the leaning back angle of the head tube the right angle of the rake is also leaning back. Which means if you turn the wheel the tip of the right angle, ie the bit holding the axle and with it the wheel, is bought closer to the ground which will lift the front end of the bike as you say. Ok got that. But when would it ever fall? Whatever the rake is, so long as there is one, the bike must always rise. Good diagram Dave! And good explanation. Who is this woman Ms Paint? You're right. Buy yourself a beer mate, make it two in fact. I'm impressed. Did you know that before or did you work it out? Now I see why it falls. It was the 'A' rotating around 'B' that clinched it. Cheers. But now I dont see why it would ever rise because 'B' is always going to be 'above' 'A' before turning. Also why is there only one rake that will give neutral steering for any given head tube angle and wheel radius? It seems to me that neutral can only be achieved with no rake at all. And who is Ms Paint? Some bikes even reverse the fork! With the same wheel and steering angle the green lines show how fitting a fork with a much bigger rake could produce neutral steering. I hope its obvious that any other amount of rake would result in the steering axis not passing through the contact point. The red line shows how an increase in the steering angle can be countered by a fork with a tiny rake to achieve the same condition. Again, only one value of rake will do it. Dave THANKS. For the simple explanations and excellent diagrams. That's saved me so much brain ache. Cunobelin wrote: Some bikes even reverse the fork! ukdodger wrote: Ok so I'm a bit thick but I dont understand this. This is a summery taken from a book on frame design: Fork rake is the perpendicular distance between the head tube centre line and the front wheel axis. ie, the amount by which your forks are bent forward. For any given wheel radius and head tube angle (that's the angle between the centre line of the head tube and the horizontal) there is only one fork rake that will achieve neutral steering. Ok that makes sense to me but here's the bit I dont understand - Neutral steering simply means that the forks will neither rise nor fall when turned. You don't get it because it's nonsense! For a proper explanation of steering you need to read Bicycling Science by DG Wilson, however it's rather hard to get one's head around the mathematics, so here's the basics. The steering geometry of all practical bicycles is such that the centre of gravity falls slighty as the steering is turned away from the straight ahead position. In other words: once the steering has been turned slightly, the weight of the bike tends to make it turn further. This tendency is resisted in the case of a stationary bike by tyre friction and when it's moving by the combined effect of tyre rolling drag and trail (as I decribed before and someone quoted above). I suppose you could say that "Neutral steering" exists when when the force of gravity trying to turn the steering further is exactly balanced the effect of trail trying to straighten it up. But even that is not true. Both effects vary in a complex manner as the steering is turned, so they cannot exactly balance at every angle of turn - even before you add the further complication of lean angle! In practice we find that in bikes with nice steering, the trail effect is greater than the gravity effect, so the bicycle has a slight overall tendency to keep going in a straight line in spite of the gravitational tendency of the steering to flop. 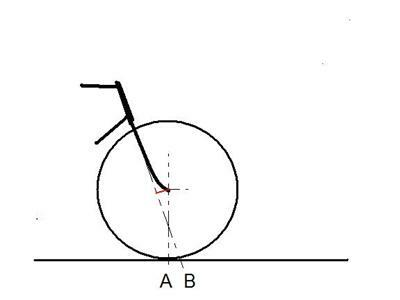 If you hold a stationary bicycle vertical and disturb the handlebars enough to overcome tyre friction (the gravitational flop effect is very slight for small angles of turn but gets stronger as the handlebars are turned further) you'll see that the steering comes to rest at something less than a right-angle of turn. That's the angle at which the bike is lowest. Turn the bars further and the bike begins to lift again. It's a geometrical coincidence that if fork offset equals trail, the bike will resume its straight-ahead height when the steering is turned to a right-angle. Of course you never turn the steering anything like that far, but a person with a "little learning" in geometry, may possibly assume that if the bike is the same height at zero and 90 degrees of turn, then it's height doesn't change when you turn it between those angles. Unfortunately, as has been shown by those neat diagrams above, that is not the case. However it is another coincidence that for typical bike head angles, the condition of offset = trail usually produces okay steering. Actually, this coincidence works better for the shallower head angles and more draggy tyres that were common in the past. With a steep 73 degree head and narrow racing tyres, much less offset is wanted in order to leave enough trail to avoid unstable steering. And, as shown in the picture of the recumbent above, when head angle approaches vertical the forks must be offset backwards (like a furniture castor) in order to produce the necessary trail. Thanks CJ. I dont fully understand what you are saying but in spite of that I still think the rising and falling bit does have to do with oversteering and understeering if only because it makes sense that if your weight shifts forward it will increase the turn and if backwards it will fight the turn. Gyroscopic and trail effects notwithstanding that is. According to the book I'm studying deliberate oversteer is built into the fork rake to compensate for the Gyro and trail effect. Actually, I'm afraid I was a bit too generous about DaveP's diagram. It's nice, but it doesn't show what he thinks it shows. I've added another couple of points and another diagram. DaveP wrote: The red line shows the extent to which the wheel centre is offset from the axis of the steering head bearings. As the point of contact moves away from the straight running position the tyre will also be moving upwards, away from the road surface, so the front end of the bike will drop slightly to remain in contact. It's not quite as simple as that. For as the steering is turned the end of the fork also moves along the line (that's red in Dave's diagram) from point C to D, so the centre of the wheel is moving downwards at the same time as point A is moving upwards. And the point of road contact does not remain at A, but relocates from point A towards point B. The weight will be supported, but not quite as before - the contact point will now be off to one side of the steering axis, so the weight will now, in the example sketched, be helping to turn the steering further - positive feedback. 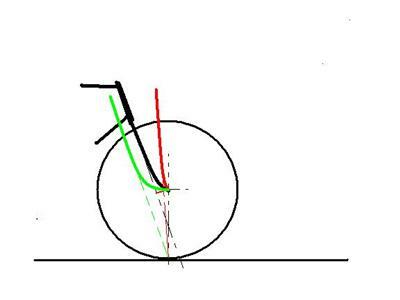 In spite of the fact that the three-dimensional geometry were are dealing with here is a lot more complex than this simple diagram suggests, that much is true: for all practical bicycle geometries the front of the frame does fall very slightly as the steering is initially turned. Interestingly, Dave's diagram shows a fork where offset equals trail, so I've added a second diagram with the steering turned to 90 degrees. The wheel is inclined at the steering angle with its contact shifted to B, so its centre is nearer to the ground, by a distance that equals the downward movement of the fork end from C to D.
This is what Dave has shown by the green fork in his later diagram, but is a fallacy. If one superimposes B and A, by means of a fork with much more offset, the end of the fork will move down further when it it turned, but the centre of the wheel will still fall the same amount as a function of head angle. Although a right-angle turn produces a net rise in the front of the bike, that geometry nevertheless produces an initial fall. And as there is no trail to counteract this fall, such a bicycle is noticably unstable - as discovered by DEH Jones in his "unrideable bicycle" research. Dr Jones' work is mentioned in this excellent Velonews article that reduces the complexities of steering geometry into reasonably simple terms. It's also worth reading the Wikipedia entries on David E. H. Jones and Bicycle and motorcycle dynamics.